Osceola was named Billy Powell at birth in 1804 in the Creek village of Talisi, now known as Tallassee, Alabama, in current Elmore County. “The people in the town of Tallassee…were mixed-blood Native American/English/Irish/Scottish, and some were black. Billy was all of these.” He was born to Polly Coppinger, a Creek woman, and William Powell, an English trader. Polly was the daughter of Ann McQueen and Jose Coppinger. Because the Creek have a matrilineal kinship system, Polly and Ann’s other children were all considered to be born into their mother’s clan; they were reared as traditional Creek and gained their status from their mother’s people. Ann McQueen was also mixed-race Creek; her father James McQueen was Scots-Irish. Ann was likely the sister or aunt of Peter McQueen, a prominent Creek leader and warrior. Like his mother, Billy was raised in the Creek tribe. Like his father, Billy’s maternal grandfather James McQueen was a trader; in 1714 he was the first European to trade with the Creek in Alabama. He stayed in the area as a fur trader and married into the Creek tribe. He became closely involved with the people. He is buried in the Indian cemetery in Franklin, Alabama near a Methodist Missionary Church for the Creek. In 1814, after the Red Stick Creek were defeated by United States forces, Polly took Osceola and moved with other Creek refugees from Alabama to Florida, where they joined the Seminole. In adulthood, as part of the Seminole, Powell was given his name Osceola. This is an anglicized form of the Creek Asi-yahola, the combination of asi, the ceremonial black drink made from the yaupon holly, and yahola, meaning “shout” or “shouter”. In 1821, the United States acquired Florida from Spain. More European-American settlers started moving in, encroaching on the Seminole. After early military skirmishes and the 1823 Treaty of Moultrie Creek, by which the US seized northern Seminole lands, Osceola and his family moved with the Seminole deeper into central and southern Florida. As an adult, Osceola took two wives, as did some other Creek and Seminole leaders. With them, he had a total of at least five children. One of his wives was African American, and he fiercely opposed the enslavement of free peoples. Through the 1820s and the turn of the decade, American settlers kept up pressure on the US government to remove the Seminole from Florida to make way for their desired agricultural development. In 1832, a few Seminole chiefs signed the Treaty of Payne’s Landing, by which they agreed to give up their Florida lands in exchange for lands west of the Mississippi River in Indian Territory. According to legend, Osceola stabbed the treaty with his knife, although there are no contemporary reports of this. Five of the most important Seminole chiefs, including Micanopy of the Alachua Seminole, did not agree to removal. In retaliation, the US Indian agent, Wiley Thompson, declared that those chiefs were deposed from their positions. As US relations with the Seminole deteriorated, Thompson forbade the sale of guns and ammunition to them. Osceola, a young warrior rising to prominence, resented the ban. He felt it equated the Seminole with slaves, who were forbidden to carry arms. Thompson considered Osceola to be a friend, and gave him a rifle. Later, though, when Osceola quarreled with Thompson, the agent had the warrior locked up at Fort King for a night. The next day, to get released, Osceola agreed to abide by the Treaty of Payne’s Landing and to bring his followers in to the fort. On December 28, 1835, Osceola led an attack on Fort King (near modern-day Ocala) which resulted in the assassination of the American Indian Agent Wiley Thompson. Simultaneously, Micanopy and a large band of Seminole warriors ambushed troops under the command of Major Francis Dade south of Fort King on the road to Fort Brooke (later Tampa). These two events, along with the Battle of Withlacoochee on December 31 and raids on sugar plantations in East Florida in early 1836, marked the beginning of the Second Seminole War. In late October 1837, Osceola contacted General Joseph Hernandez, through a black interpreter named John Cavallo (also John Horse), to arrange negotiations about ceasing hostilities. General Thomas Jesup responded by ordering Hernandez to seize Osceola and his party should he have the chance. Osceola’s camp, located one mile south of Fort Peyton, raised a white flag of truce in order to signal their desire to negotiate. When Hernandez and his entourage reached the camp, they promptly seized Osceola and the warriors, women and children present. Osceola and his band were brought to St. Augustine and imprisoned at Fort Marion (Castillo de San Marcos). Remarkably, on November 30, Coacoochee (Wildcat) and 19 other Seminoles escaped Fort Marion; Osceola was not among them. Coacoochee’s escape prompted Jesup to transfer the most important Seminole captives out of the area. In late December 1837, Osceola, Micanopy, Philip and about 200 Seminoles embarked from St. Augustine for Fort Moultrie on Sullivans Island, outside Charleston, South Carolina. After their arrival, they were visited by townspeople. 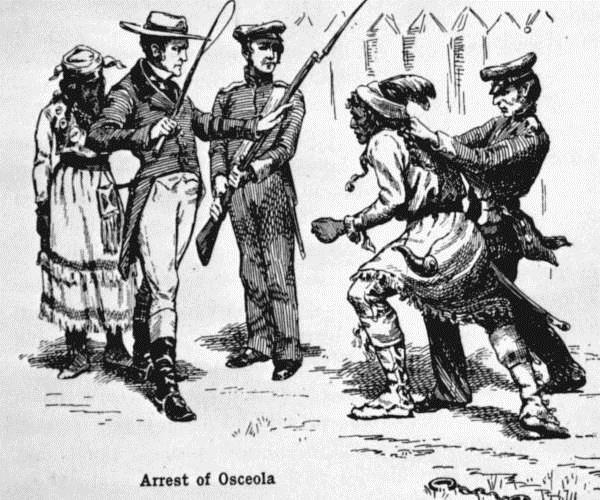 Osceola’s capture by deceit caused a national uproar. General Jesup and the administration were condemned by many congressional leaders. George Catlin and other prominent painters met the war chief and persuaded him to allow his picture to be painted. The painting above is by Catlin. 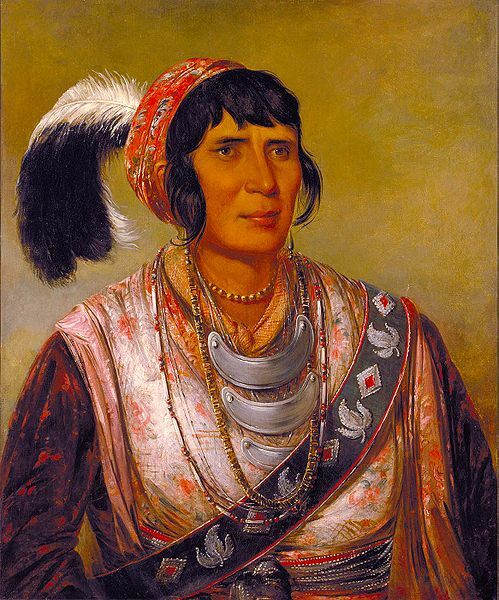 Robert J. Curtis painted an oil portrait of Osceola as well. These paintings have inspired numerous prints and engravings, which were widely distributed, and even cigar store figures. 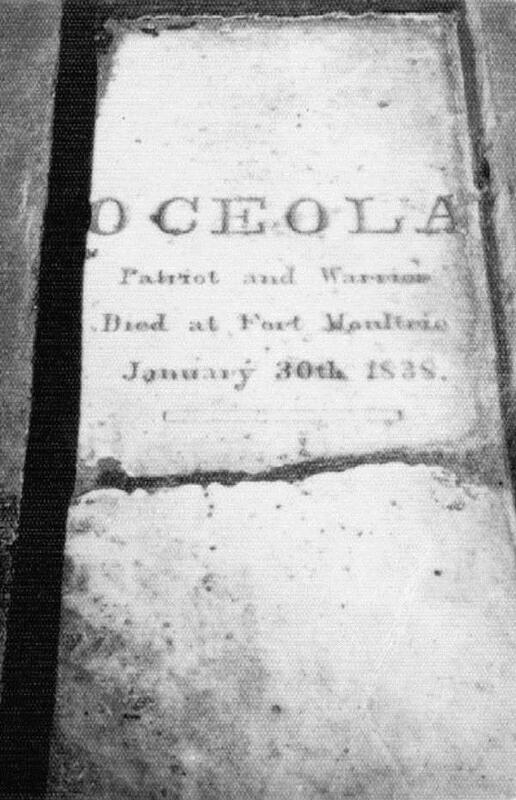 Osceola, who previously contracted malaria in Florida, became severely ill soon after arriving at Fort Moultrie. Osceola died of quinsy (though one source gives the cause of death as “malaria” without further elaboration) on January 30, 1838, three months after his capture. He was buried with military honors at Fort Moultrie. After his death, army doctor Frederick Weedon persuaded the Seminole to allow him to make a death mask of Osceola, shown below, as was a European-American custom at the time for prominent people. Later Weedon removed Osceola’s head and embalmed it. For some time, Weedon kept the head and a number of personal objects Osceola had given him. Later, Weedon gave the head to his son-in-law Daniel Whitehurst. In 1843, Whitehurst sent the head to Valentine Mott, a New York physician. Mott placed it in his collection at the Surgical and Pathological Museum. It was presumably lost when a fire destroyed the museum in 1866. Some of Osceola’s belongings are still held by the Weedon family, while others have disappeared. 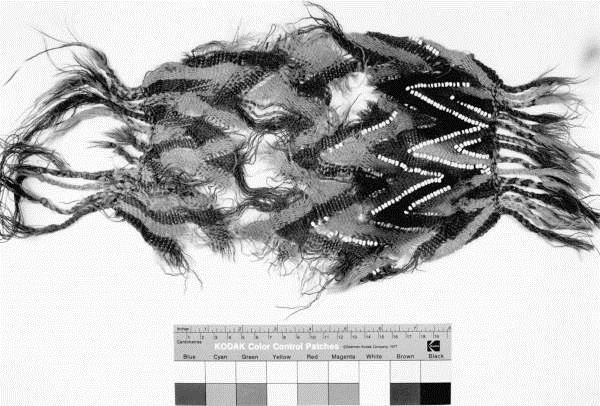 One of Chief Osceola’s possessions is shown below. 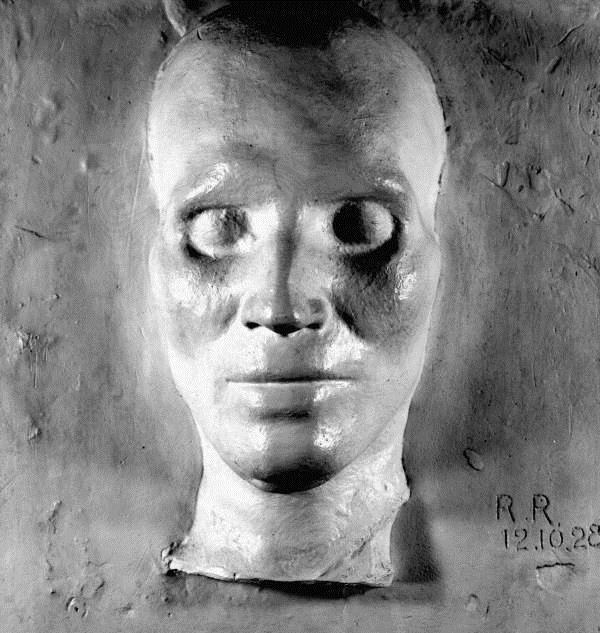 Captain Pitcairn Morrison sent the death mask and some other objects collected by Weedon to an army officer in Washington. By 1885, the death mask and some of Osceola’s belongings ended up in the anthropology collection of the Smithsonian Institution, where they are still held. This entry was posted in Creek, Seminole, Traders, Treaty. Bookmark the permalink. I was told that my grandmother (Elna Powell) was the daughter of one of Chief Osceolas daughters….if anyone can help me with my ancestory please contact me…. @ michaelaneider@yahoo.com….. thank you. 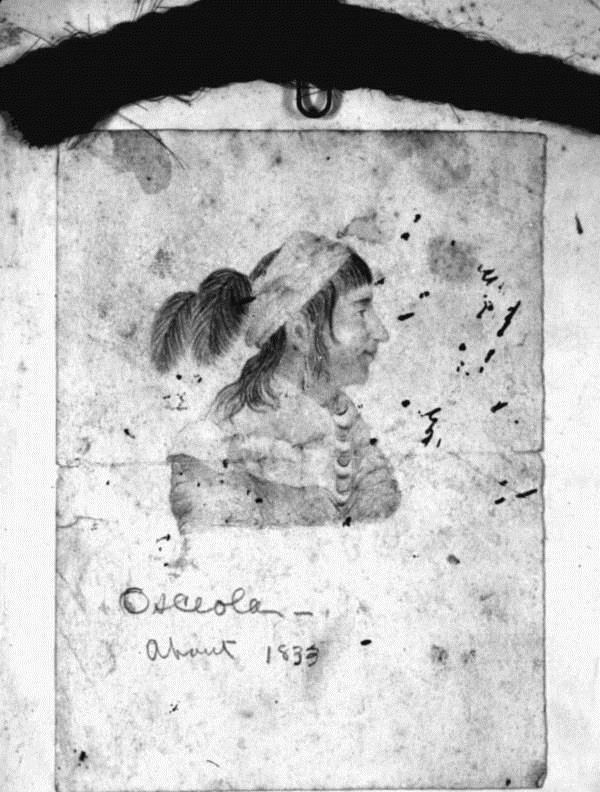 Chief Osceola was the son of my great, great Uncle Billy Powell. Osceola is in out Powell Family History Book. Can I get a copy of the Powell History Book. I was told it was out of production. I WAS Informed that Chief Osceola is our great, great, great grandfather. My great grandmothers name was Ola Ellington from Dothan, Houston County, Alabama. Her mother was Native American. I would love to find out for sure if we are descendants of the great Chief Osceola! My name is Nancy E. Renfrow. I am soon to be 76 years old.My paternal grandmother was Nanny Powell Renfrow. Osceola’s grandfather ( William Powell’s father ) was Absolam Powell the 1st. Absolam Powell the 1st was my great, great, great, great grandfather. I love Catlin’s painting of Osceola. I have a small original print of Osceola. Some of the information the family believed does not agree with information I read online. What information does the family believe? My Mother was a Powell. She grew up in Fair Bluff, NC. She mentioned that she was related to Osceola. She mentioned Absolam Powell as well. She said he was a preacher during the Confederate War. She has a Powell Family Book which was created by Bruce Powell. I was shopping recently at Home Depot and an elderly associate ask me what my name was. When I told him, Billy Powell he relayed a brief history of Osceola. This peaked my interest and I began researching Osceola and found a few interesting points. His mother was Polly Coppinger and father William Powell. My father who died in 2000, his only sister was named Polly. His brother, Luther Frank Powell passed away in the early 1990’s and Polly a few years later. All the Powell’s were born and raised in the south Alabama Florida panhandle area and lived in the Troy as well as Montgomery, Tallassee and Franklin Alabama areas. Seems more coincidental, but maybe there is a distant relationship to Osceola. Plan to do further research and DNA ancestry background check to find a possible link. Hello, I live in Macon Co, Alabama and would be interested in talking with you about the Powell family of Macon Co and Osceola. 334-444-5466 . Hope to hear from you. I’d love to hear more from some of you. After digging further into my family background, i found out that my Grandmother, “Osceola” was named after my great, great, great grandfather who was a slave that sought refuge in the Seminole tribe. One of the conditions of him staying there was to marry Chief Osceola’s niece and to name all of his descendants Osceola. My great Grandmother was named Osceola, after her my grandmother was named Osceola, along with my father’s sister (my auntie) that was named Osceola. The tradition of passing the name down stopped there due to very trivial matters. If anyone has any genealogy of the Chief and his brother please contact me by email. Perhaps you could find descendants or relatives of Osceola’s father and compare their DNA with your DNA to see if there is a match, then you would know for certain, provided there is a match. It would perhaps also answer the question as to whether or not William Powell was Osceola’s biological father. I am willing to cooperate with DNA match. My DNA matches John William Powell Chufi Hadjo and Chekika Polly Ann Coppinger Powell, Parents of Osceola. I have many pictures of my findings on Facebook if you’d like pictures and proof. I look identical to Osceola’s Bust Death mask in St. AUGUSTINE, Fl. I thought the statue was me at first. Hello, Ben. Are you on Ancestry? My family is on that site as to our DNA results. We are direct descendants of James Powell, William Powell’s brother. Ben, I have a cousin on Ancestry.com, Timothy Powell, who is a direct descendant of James Powell (William Powell’s brother). If you were to add your DNA results to Ancestry, hopefully, Tim Powell would show up as a match as a cousin of some sort. We would then know for certain of the connection and that William Powell was, in fact, Osceola’s biological father. To know for sure, you have to match on the same segment with at least two people proven to have the same ancestor and to not have other common ancestors. You can’t do that at Ancestry because they don’t provide you with segment information. Does anybody know the names of Osceola’s wives? I had heard that Oskaloosa, Iowa was named after a wife of Osceola named Ouscaloosa. I can’t find that name anywhere. There is also a city in Iowa named after Osceola. I can’t find the connection to Iowa. MY name is Benjamin Powell and I am the 4x Great Grandson of Osceola Billy Powell. I am trying to connect with our People and learn about our culture. I moved a lot and reside in Northeast Mississippi. I’d very much love to connect with our people. Andrew Jackson ordered my entire bloodline to be killed. We made it by going to London,England for a time and came back. I’m reaching out to anyone who can enlighten me about my family. My telephone number is (662)596-5938. Text first and let me know who you are and I will reply. Hope to meet you all some day! Mvto, Thank you, Ben Powell. I have found many names for My 4x Great Grandmother, wives of Osceola Billy Powell. I was told Peoka. Then there’s Che Cho Ter his other wife. I found Oscalousa meaning last of the beautiful. Ouichee and Ahlikchen. The most promising I found was a letter by Congress in 1836 stating that Us Se YOHOLO had several children with the daughter of Mad Wolf aka Yaha Hajo. Her name is Lousanna Harjo. I seek her to find a clan and name of our Band of Seminole. I know Os Se YOHOLO is enrolled on the Talisi Tribal Town Rolls of 1832 as number 161. I’ve spent 5 exhausting months searching night and Day for the answers. I am Benjamin Powell,Osceola Billy Powell is my 4x Great Grandfather and His wife Peoka Powell is my 4x Great Grandmother. Does anyone have any family information about Peoka? I know they had my 3x Great Grandfather John Wesley Powell. I need more information to plug into our family tree. What is Peoka’s Christian name? I know she is half Seminole and half Scotts Irish. I know we come from Wind Clan. Apparently I’m Tuhkabatchee. I was Raised White. This is a wonderful journey. What I’ve ascertained thus far is that James McQueen punched his commanding officer in the Royal Navy and jumped ship and swam back to land. He settles with the Muscogee(MVSKOKE) Creek. He married Katherine Redstick Fraser, the Daughter of Chief (Mico) Eagle Wings of Tuhkabatchee. Together James and Katherine had Peter McQueen Talmuches Hodjo, Mico of the Tallassees. Osceola claimed this and that he was Tuhkabatchee. James and Katherine also had Anne McQueen who married Don Jose Coppinger, the last Florida Governor appointed by Spain. Anne and Jose Coppinger had Chekika Polly Ann Moniac Coppinger, the Mother of Osceola Billy Powell. Chekika Married John “William”Powell (Chufi Hadjo) during the Wars our family went to Florida to stay with Chekika’s Cousin of the Seminole. Osceola married Peoka and had John Wesley Powell. John Wesley Powell is my 3x Great Grandfather. I am the direct descendant of Osceola Billy Powell. I’m trying to learn about our Muscogee and Seminole customs and language. Kind of difficult as I live in Mississippi and far away from our people. Looking for family that can teach me more.